(AP) -- Oprah Winfrey got plenty of `likes' on Facebook Thursday from fans who tuned in to watch a live online chat with the social networking site. The TV personality gave a one-hour interview to Facebook Chief Operating Officer Sheryl Sandberg at the company's Palo Alto, Calif., headquarters. The chat took place in front of an audience of Facebook employees who cheered and took photos on camera phones when she walked out. "One of the first things she wanted was...the walls taken down...everybody's out in the open and her offices are dogs and kids and music is playing and there's a candy bar and a cookie bar... ."
Life has not slowed down since wrapping up "The Oprah Winfrey Show" in May. "I think everybody thought I was gonna sit at home and relax...every time I run into people they say "How is it? How's retirement?" First of all I was never intentionally retiring. It's a little more frantic. The days were a little more organized. I feel a little out of body some days." 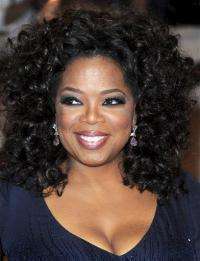 Winfrey is now focused on developing her OWN television network. She serves as its chairman, CEO and chief creative officer. "It's a lot harder than I ever imagined. If anybody asks you if you want a network think about that," she joked. She also said she never felt fear until she decided to launch OWN. "The fear is getting this right and the fear is whether or not I'm ahead of my time. I fundamentally believe people are yearning for something more but if I look at, if you look at what's on television right now it doesn't look that way. The fear is I hope I'm right." Viewers tuning in posted comments like, "Oprah, I love listening to you" and "I totally get it." One posted her phone number and asked for a call. Winfrey responded to a special lightning round of random questions where she shared she likes thin crust pizza over deep dish, Chai tea to coffee and the iPad to actual books or the Kindle. Winfrey toured the Facebook offices prior to her live chat and brought along employees from O magazine, OWN and Harpo because she believes they can learn from the social media site. "Facebook's goal is to connect everybody in the world, my goal is to connect with people so they see for themselves the greater possibilities of their lives." Facebook Live has hosted a number of big names for online chats including President Obama, Bill Gates and singer Katy Perry.